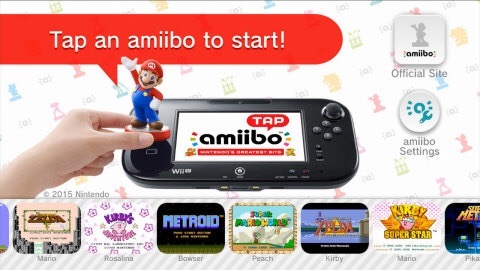 Download the free amiibo tap: Nintendo's Greatest Bits application in the Nintendo eShop on Wii U and tap any amiibo figure to the Wii U GamePad controller to unlock scenes from select NES and Super NES Wii U Virtual Console games. Discover definitive moments from classic Nintendo games. Download the free amiibo tap: Nintendo’s Greatest Bits application in the Nintendo eShop on Wii U and tap any amiibo figure to the Wii U GamePad controller to unlock scenes from select NES and Super NES Wii U Virtual Console games. At least one amiibo figure (sold separately) is required to use this software. After Bowser steals the Star Rod and kidnaps Princess Peach, Mario plots to rescue the seven Star Spirits and free the Mushroom Kingdom from the Koopa’s rule. The turn-based battle system of this classic Nintendo 64 RPG will make fighting Bowser’s baddies equal parts strategy and timing. Download the free demo version of Puzzle & Dragons Super Mario Bros. Edition before the full game launches in stores and in the Nintendo eShop. Intuitive drag-and-match puzzle game play and classic Mushroom Kingdom characters combine to create one of the most unique puzzle/RPG games ever. – Download the free demo version of Puzzle & Dragons Super Mario Bros. Edition before the full game launches in stores and in the Nintendo eShop. Intuitive drag-and-match puzzle game play and classic Mushroom Kingdom characters combine to create one of the most unique puzzle/RPG games ever. The full version of the Puzzle & Dragons Z + Puzzle & Dragons Super Mario Bros. Edition game, which gives you two complete games in one package, launches May 22. – Big savings on select games from Shin’en for spring! Check out these great deals in the Nintendo eShop on Nintendo 3DS and Wii U beginning at 9 a.m. PT on April 30 until 8:59 a.m. PT on May 21. Visit http://www.nintendo.com/eshop/offersfor more details. How to Train Your Dragon 2 on Wii U and Nintendo 3DS, Monster High: 13 Wishes on Wii U and Nintendo 3DS, Young Justice: Legacy and more titles from Little Orbit are on sale beginning at 9 a.m.PT on May 1 until 8:59 a.m. PT on May 31. – Voting is now over. Check back on May 7 to see which classic Mega Man game fans decided should be released first. For the entire month of May, Nintendo and Capcom are celebrating everyone’s favorite blue bomber with six game releases in the Virtual Console on Wii U. The Game Boy Advance versions of Mega Man Zero 2, Mega Man Battle Network 3 Blue, Mega Man Battle Network 3 White, Mega Man Battle Network 4 Red Sun, Mega Man Battle Network 4 Blue Moon and Mega Man & Bass will land in the Nintendo eShop throughout the month.